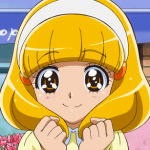 Appearing in Smile Precure!, Yayoi is a classmate of Miyuki and company. Known for being shy and a crybaby, she lacks confidence in her ability to follow through with anything, but she treasures the warmth and support her friends provide. A skilled artist who dreams of working in the manga industry, she is a big fan of robots and other superhero stories. Yayoi transforms into Cure Peace to fight the forces of the Bad End Kingdom.